A great destination between the holidays. 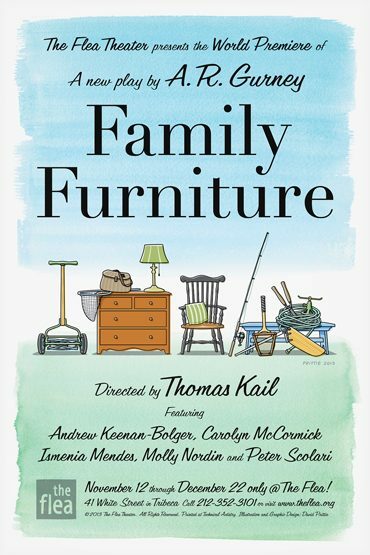 Family Furniture is a coming of age tale about a family and one certain summer when everything shifts. Gurney gives us Buffalo, gin and tonics, tennis doubles with the Baldwins, vichyssoise and so much more in this heartfelt tale about parents and children. Directed by Tony Award nominee Thomas Kail (In The Heights) starring Carolyn McCormick (Law & Order), Peter Scolari (Girls, Newhart, Bosom Buddies), and Andrew Keenan-Bolger (Newsies) with newcomers Ismenia Mendes and Molly Nordin. A.R. Gurney has been writing plays for over fifty years. Among them are: The Grand Manner, Scenes from American Life, The Dining Room, The Middle Ages, The Cocktail Hour, Love Letters, Sylvia, Far East, Ancestral Voices, Big Bill Indian Blood, Crazy Mary, and Buffalo Gal. At The Flea he has premiered Heresy, Post Mortem, O Jerusalem, Screenplay, Mrs. Farnsworth, A Light Lunch and Office Hours. He has also written three novels, a few television scripts, several unproduced movies, and the librettos of two operas. Gurney is a member of the Theatre Hall of Fame and the American Academy of Arts and Letters. He has honorary degrees from Williams College and Buffalo State University, and taught literature at M.I.T. for many years. Thomas Kail Broadway: In the Heights (Tony nom. ); Lombardi; Magic/Bird. Off B’way: In the Heights(Callaway Award, Drama Desk nom., Outer Critics nom. ); Lincoln Center Theater: Broke-ology, When I Come to Die; New York City Center: The Wiz; Second Stage Uptown: The Tutors. Other credits include: Williamstown Theater Festival: Broke-ology. National Tour: In the Heights. Paper Mill Playhouse: Once on this Island. Co-creator and director of the hip-hop improv group Freestyle Love. Recipient of the Martin E. Segal Award from Lincoln Center. Graduate of Wesleyan University, CT.